Sensor adjustment range is 10.2–45.7cm (4–18"). Available with a thermostatic mixing valve (TMV), which delivers water at a preset temperature by mixing hot and cold water. 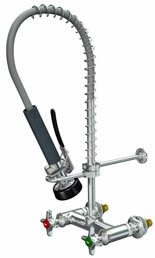 Rigid spread gooseneck measures 15.2cm (6"). Application: Deck mounted faucet for cold water. Inlet: 3/8” NPT male inlet. Furnished complete with locknut and washer. Outlet: 3/8” NPS female outlet with removable ten serration hose end. L612 Same as above except with swing gooseneck. 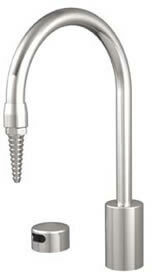 L614 Same as above except with ­convertible rigid/swing gooseneck. Gooseneck: 6” rigid gooseneck. 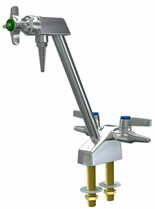 Gooseneck is set in right hand configuration unless left hand or 180 degrees is specified. L612VB Same as above except with swing gooseneck. L614VB Same as above except with convertible rigid/swing gooseneck. Application: Panel mounted faucet with vacuum breaker for cold water. Inlet: 1/2” NPT female inlet. Furnished complete with mounting shank, locknut and washer. Use suffix “WSA” if mounting shank is assembled. L2714L-VB-WS Same as above except with handle on left side. L2714WS Panel mounted single faucet, without vacuum breaker. 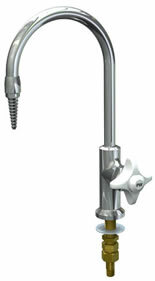 L2714L-WS Panel mounted single faucet, without vacuum breaker, handle on left hand side. The 4-arm KNOB handles illustrated have a part number of BA013TS. The standard polished chrome knob handles may be interchanged with "BH" 4" Wrist Blade handles should ADA compliance be required. The Chrome knob handles are not interchangeable with a ColorTech faucet. This exchange of handles only works for the "L" series. These can be changed out by loosening a handle set screw and switching the handle. Application: Deck mounted faucet for hot and cold water. Inlet: 1 3/16” male shank with (2) 3/8” OD flexible copper tubes. Furnished complete with locknut and washer. L411 Same as above except with rigid gooseneck. L414 Same as above except with convertible rigid/swing gooseneck. Application: Deck mounted mixing faucet with vacuum breaker for hot and cold water. Body: Forged brass with polished chrome plated finish.Valve Units: WaterSaver self-contained compression valve units with replaceable stainless steel seats. L411VB Same as above except with rigid gooseneck. 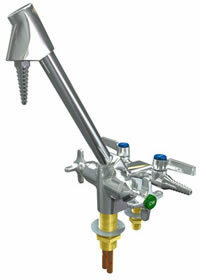 L414VB Same as above except with ­convertible rigid/swing gooseneck. Outlet: 3/8” NPS female outlet with removable aerator. L410VB Same as above except with ­vacuum breaker. Application: Deck mounted faucet on 8” centers for hot and cold water. Body: Brass bar stock with polished chrome plated finish. Inlets: (2) 1 3/8” male shanks with 3/8” OD flexible copper tube inlets. Center fitting has 3/8” NPT male inlet. Furnished complete with (2) flexible PVC hoses, center tee fitting, locknuts and washers. Quality Assurance: Faucet is assembled and factory tested prior to shipment. L2211 Same as above except with rigid gooseneck. L2214 Same as above except with convertible rigid/swing gooseneck. Note: If faucet is to be used with pedal valve, add suffix “TWI”. Application: Deck mounted faucet with vacuum breaker on 8” centers for hot and cold water. L2211VB Same as above except with rigid gooseneck. L2214VB Same as above except with rigid/swing gooseneck. The Chrome knob handles are not interchangeable with a ColorTech faucet. This exchange of handles only works for the "L" series faucets. These can be changed out by loosening a handle set screw and switching the handle. Application: Deck mounted pre-rinse unit for hot and cold water. Pre-Rinse Assembly: Self-closing squeeze valve with rubber-bound spray head, insulated handle and locking ring. Valve is mounted on spring loaded 39” stainless steel hose. PR611 Same as above except for cold water only. Body: Cast brass with polished chrome plated finish. Inlet: 3/8” NPT female union inlets. Furnished complete with mounting shanks, locknuts and washers. If mounting shanks are to be assembled, use suffix “WSA”. Base: Forged brass with polished chrome plated finish. 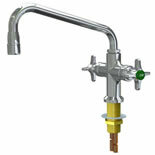 Gooseneck: 6” rigid gooseneck with 3/8” NPS female outlet and removable ten serration hose end. Ball Valves: (2) laboratory ball valves for gas, air or vacuum service (specify service when ordering). Valves are forged brass with lever handle and integral ten serration hose end. Inlets: (2) 3/8” NPT male inlets. Furnished complete with locknuts and washers. L66VB-WSA Same as above except with vacuum breaker. 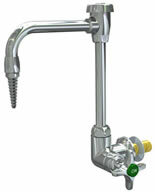 Gooseneck: 6” rigid gooseneck with 3/8” IPS female outlet and removable ten serration hose end. Ball Valves: (2) laboratory ball valves for gas, air or vacuum service (specify service when ordering). 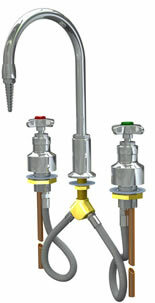 Valves may be used for different services. Valves are forged brass with lever handle and integral ten serration hose end. Inlets: (3) 3/8” NPT male inlets. Furnished complete with locknuts and washers. L68VB-WSA Same as above except with vacuum breaker. Riser: 1/2” IPS heavy wall brass pipe. Water Valve Body: Forged brass with polished chrome plated finish. 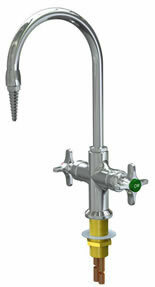 Water Valve Unit: WaterSaver self-contained compression valve unit with replaceable stainless steel seat. Handle: Black nylon hooded style handle with color-coded index disc. L5300-110WSA Same as above except with L110 in-line vacuum breaker. Note: The L5300WSA and L5300-110WSA are available with fully vandal-resistant construction. 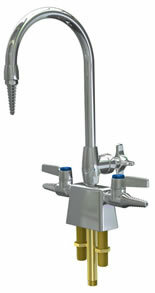 Application: Deck mounted faucet for distilled, deionized or reverse osmosis water. All components in contact with water have pure tin coating. Body and gooseneck are dipped in liquid tin to coat all interior surfaces. 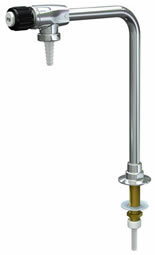 Valve Unit: WaterSaver self-contained renewable unit with replaceable stainless steel seat. Valve has self-closing control. Handle: White nylon four-arm handle with color-coded index disc. Inlet: 3/8” IPS male shank with 1/4” NPT male tailpiece. Furnished complete with locknut and washer. L682 Same as above except with swing gooseneck. L684 Same as above except with convertible rigid/swing gooseneck. Note: If faucet with manual on/off (compression) control is desired, order L691, L692 or L694. 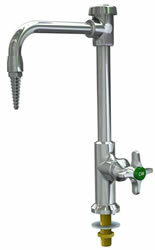 Application: Panel mounted faucet for distilled, deionized or reverse osmosis water. All components in contact with water have pure tin coating. Body and gooseneck are dipped in liquid tin to coat all interior surfaces. Inlet: 1/2” NPT female inlet. Furnished complete with mounting shank, locknut and washer. If mounting shank is to be assembled, use suffix “WSA”. L2784L-WS Same as above except with handle on left side. Note: If faucet with manual on / off (compression) control is desired, order L2794WS or L2794L-WS. 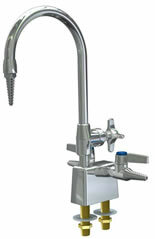 Application: Deck mounted faucet for distilled, deionized or reverse osmosis water. Faucet has exterior brass casing and interior lining of inert polypropylene. Pure water comes in contact only with inert plastic. Handle: Black nylon knurled handle with color-coded index disc. Riser: 6” rigid brass riser. Inlet: 3/8” IPS male shank with 3/8” OD tube connection. Furnished with 3/8” OD compression adaptor for inlet. L7833SC - Same as above except with toggle-style handle and self-closing control. Application: Deck mounted faucet for distilled, deionized or reverse osmosis water. Faucet is fully recirculating to eliminate all “dead legs” in pure water system. Inlet: 7/8” OD male shank with 3/8” OD tube connections on supply and return. Furnished with 3/8” OD compression adaptors. 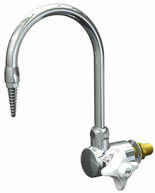 Application: Vandal-resistant deck mounted single faucet with 6” rigid vacuum breaker gooseneck and serrated hose end. Furnished with WaterSaver self-contained compression valve unit with stainless steel seat. Inlet shank is machined from solid brass bar stock with extra heavy wall to resist breakage. Faucet base has pins to prevent turning fixture on counter. Packing nut is secured with set screw to prevent removal. Index disc is cemented in place. Gooseneck riser is 1/2” IPS heavy wall pipe to resist bending and breakage. 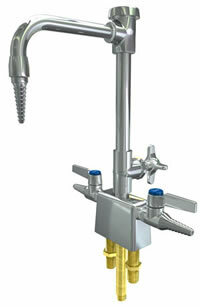 Vacuum breaker has vandal-resistant brass bonnet and cover screws to prevent removal. VR614VB Same as above except with convertible rigid/swing gooseneck in place of rigid gooseneck. 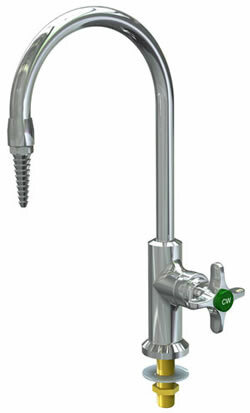 Application: Vandal-resistant deck mounted mixing faucet with 6” rigid vacuum breaker gooseneck and serrated hose end. Furnished with WaterSaver self-contained compression valve units with stainless steel seats. Mounting shank is machined from solid brass bar stock with extra heavy wall to resist breakage. VR414VB Same as above except with convertible rigid/swing gooseneck in place of rigid gooseneck. 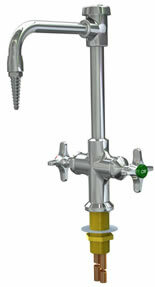 Vandal-resistant double service fixture for cold water and gas. All-forged brass construction for superior strength and durability. Furnished with WaterSaver self-contained compression valve unit with stainless steel valve seat. Two laboratory ball valves for gas service. in­line vacuum breaker on water outlet. 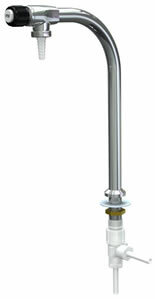 Vandal-resistant deck mounted fixture for cold water and gas, air and/or vacuum. Fixture has three inlets, so valves may be used for different services. All-forged brass construction for superior strength and durability. Furnished with WaterSaver self-contained compression valve unit with stainless steel valve seat. Two laboratory ball valves for gas, air and/or vacuum services. Three inlet shanks prevent turning fixture on counter. Water valve packing nut is secured with set screw to prevent removal. 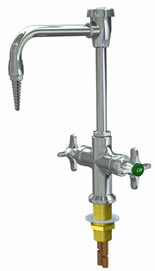 Vacuum breaker has brass bonnet and cover screws to prevent removal. 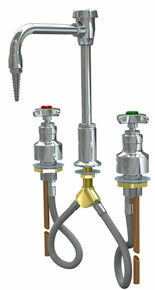 Vandal-resistant multiple service fixture for hot and cold water and gas. All-forged brass construction for superior strength and durability. Furnished with WaterSaver self-contained compression valve units with stainless steel valve seats. Two laboratory ball valves for gas service. Hooded nylon handles conceal water valve stems and packing nuts. Nuts have set screws to prevent removal. Round serrated hose end is cemented in place to prevent removal. VR5800-110WSA Same as above except with in-line vacuum breaker on water outlet.